In the world of institutional trade support, market pressures have brokerage firms between a rock and a hard place. 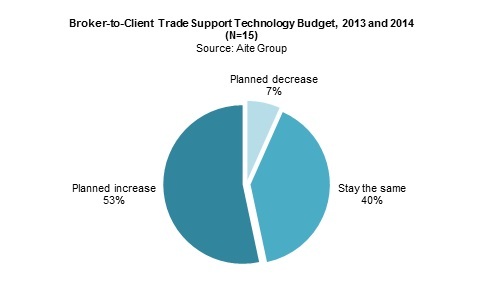 London, 4 March 2013 – A new report from Aite Group considers the broker take on today’s trade verification technology standoff. Based on Aite Group interviews with institutional brokers across the globe, the report examines middle-office investments and cost-cutting measures, broker-specific regulatory concerns, and electronic trade confirmation preferences. This piece is the second in a series of three reports devoted to the world of institutional trade support; part one focuses on post-trade communication processes and investment. Something has got to give in the world of institutional trade support, where increasing pressure to reduce operating costs, cope with high trade volume across a broad spectrum of asset classes, and respond to regulatory and infrastructure changes have placed brokerage firms and their clients between a rock and a hard place. Brokerage firms have anemic post-crisis headcounts and budgets with which to support trade, and they are unable to continue throwing bodies at the process. Despite this, brokerage firms fear being the first to invest in necessary electronic trade confirmation technology and are playing a veritable game of chicken with the asset management community. Who will invest first? This 27-page Impact Note contains 14 figures and one table. Clients of Aite Group’s Institutional Securities & Investments service can download the report.